Select the title below for more information on each of Delphi's catalog options. Explore our full product line in our 'Annual Catalog'. 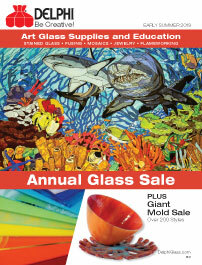 See what's on sale for the season in our 'Seasonal Catalog'. Expand your knowledge by taking one of the many classes detailed in our 'Class Schedule'. The only resource book you will ever need to feed your passion to create glass art! Our catalog is filled with a huge selection of products and thousands of new items! 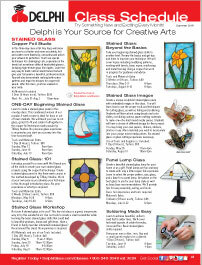 Find supplies for stained glass, fusing, mosaics, jewelry, flameworking and more. Receive this catalog FREE included with your first order, then mailed on an annual basis thereafter. 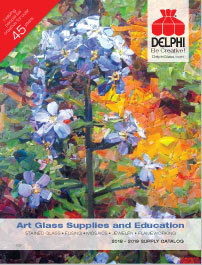 Browse Delphi's current seasonal sale catalog online. Get access to sale specials and new products that are sure to provide inspiration for your seasonal projects. Check out the seasonal coupons link and get instant access to the coupons featured in the seasonal catalog. Browse Delphi's schedule of classes and store events offered at the Creativity Center located in Lansing, MI. We offer an extensive schedule of classes covering all disciplines in art glass for all skills levels. Flip through the schedule for detailed class descriptions or click through our Class Calendar and Register Today! How long have you been working in stained glass, mosaics, hot glass or jewelry? How many projects have you made in the last 2 years? Have you ever purchased anything from Delphi?